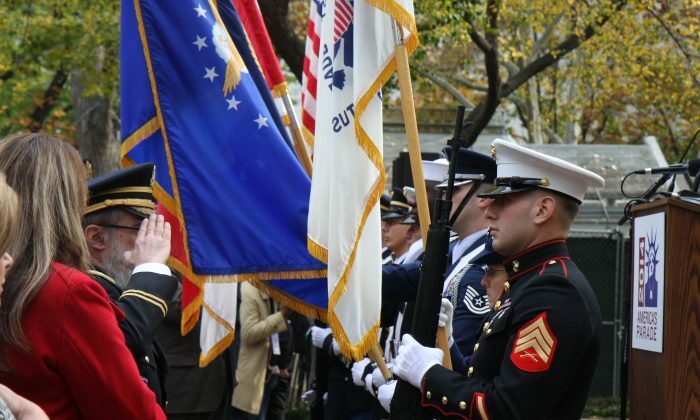 NEW YORK—Paul Bucha, veteran officer of the Vietnam War, remembers a time when the Veteran’s Day parade and ceremony was a small procession held, attended, and participated in by the same 325 veterans, for themselves. It was held a little ways down from Madison Square Park, Bucha said Tuesday in the park to a crowd of veterans and elected officials of every level. “And they told us to get on with it because we were blocking traffic,” Bucha said. Today, the New York City parade is the largest in the country. Organizers expect about 25,000 participants and 600,000 spectators. The New York City Veteran’s Day parade took on the theme “Land of the Free, Home of the Brave,” the closing lines of the national anthem. At 10 a.m., elected officials and veterans held an opening ceremony for the parade at the Eternal Light Flagstaff monument in Madison Square Park. The ceremony concluded at 11:11 a.m. with a wreath laying ceremony, kicking off the parade. Former NYPD Commissioner Raymond Kelly lead the parade as its grand marshal. Kelly, a Vietnam veteran, had followed in his three older brothers’ footsteps and joined the US Marine Corps. Every year, the parade focuses on one branch of the armed services and this year it is honoring the Marine Corps. “As a veteran, I’ve always been proud to participate in this parade,” Kelly said. There was a high level of anxiety then that he doesn’t see now, Kelly said, and he thanked the young men and women overseas and coming home today for making that happen. Bucha remembers coming home from Vietnam on a plane landing at the Travis Air Force Base in Calif. He was the only officer of the group of combat veterans who had just finished serving a year. They were sitting in a “combat slump,” unkempt and weary. But then when the plane landed, a man in front of him turned around and embraced him. “He said. ‘sir, welcome home. Thank you, and I love you,'” Bucha said. Then he turned to the combat medic beside him and said the same. Other speakers echoed his sentiment and called for better services to be provided to returning veterans. There are currently 21.8 million veterans in the United States. Up to 50,000 sleep on the streets at any given night, and the youngest veterans have the hardest time finding employment after serving, according to federal data.